A J Bird designed the Trafalgar Mansions at the corner of Nelson and Hornby for the Hose Investment Co in 1910. It cost $75,000 and was built by Adkinson & Dill. The company name came from F E Hose, the company’s President. Francis Hose was an Investment Broker who had arrived in Canada around 1900. He was born in 1870, and was married to Sybil Gwilt in 1893 in Roydon, Norfolk, UK. That same year they arrived in the US, travelling to New York on SS Teutonic, arriving on the 21st of June. He was described on arrival as a farmer. It’s possible he had been in the US from 1887 and returned to marry: the earlier immigration date is shown in the later US Census records. In 1901 their son Charles was born, and in 1911 they were living at 1659 Davie, and in the Census Mr. Hose was listed as Frank rather than Francis. Mr Hose wasn’t just an Investment Broker – he was also in partnership with J G Brooks as Hose & Brooks, liquor dealers at 514 Main Street. From 1902 Mr. Hose had run the company with Arthur Hose, probably his older brother, and Mr. Brooks was a later partner. In 1902 (the first year he appears in Vancouver) he was partner with T Allen as owners of the Stanley Park Brewery on Chilco Street, as well as the liquor store – the brewery partnership (and the brewery) seems to have been very short-lived. In 1912 Frank and Sybil had moved to Pasedena, California and J Brooks was managing Hose & Brooks on his own, with John Law running the Hose Investment Co. (Arthur Hose also disappears from the City Directories around this time). Frank Hose seems to have made enough money to effectively retire in his 40s – he was shown in the 1920 US Census as a fruit preserver, apparently at his home. He was still in California in 1931 when this Vancouver Public Library image was taken – he was in the Whittier Judicial Township, Los Angeles in 1940. As far as we can tell Frank Hose didn’t take an active role in the company that continued to carry his name. Nevertheless, he was probably aware that the company made the news in 1922. This was after the liquor distributer had survived despite the prohibition years that started in 1917, and finally ended in 1921 (in British Columbia). A year later Fred Summers, was arrested after selling policemen a half case of whisky. Liquor and beer were found that were said to be from the Hose and Brooks warehouse on Keefer Street, and the Provincial authorities closed it down while the investigation commenced. A few days later the building, and it’s $50,000 of stock, were returned to the company. Trafalgar Mansions stood for over 50 years. Today Nelson Square occupies the corner, designed by Romses Kwan and Associates and completed in 1982 for a Hong Kong developer. The top 5 floors are residential; the rest of the 25 floor building is offices. We’ve featured this building in a slightly later incarnation, when it was home to the Morning Star newspaper in 1929. What we hadn’t fully appreciated until we found this Vancouver Public Library image is that the newspaper shared the building with an industrial user – the Universal Knitting Co Ltd, whose signage in this 1922 image totally ignores the presence of the newspaper (although they were in the building at the time, and many years earlier). The 1927 image of the building on the right shows that the Knitting Company and the Star shared signage a few years later, although by 1929 the mill was no longer in the city. 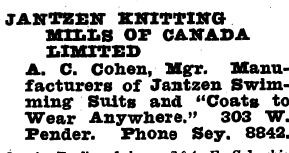 In 1922 The Universal Knitting Co was managed by A C Cohen. Abraham Cohen was American by birth, and operated a second knitting mill in the building in 1927 which was called the Jantzen Knitting Company. 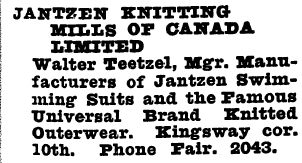 The company history of Jantzen explains how that came about “It was during the year 1924 that the Universal Knitting Mills of Vancouver, B. C. approached us with a proposition to manufacture our swimming suits in Canada, and on December 16, we passed a resolution to enter into contract with them. The contract provided for the manufacture and sale of suits in Canada on a royalty basis“. (The 1927 Directory entries for both companies are shown here). In 1928 the Canadian company moved to a new 40,000 square foot factory at “10th Avenue and the great Pacific Highway in Vancouver… The building enables the Vancouver plant to carry on most of the operations on one floor, which has been found to be more economical than operating a factory on several floors, as was previously the case at the Vancouver factory.” The new factory was only identified under the Jantzen name, but the 1929 Directory shows that the company were still producing garments under the Universal label as well. There were dozens of employees working in the new factory, many women identified as either machine operators or finishers, but all the knitters seem to have been men. The manager, Walter Teetzel was probably from Ontario and a relative of Archibald Teetzel who was associated with a Homer Street business. The Jantzen factory at 196 Kingsway continued to produce swimwear at the factory for almost 70 years, finally closing in 1997. Mr. Cohen was married in 1911 to Miss Weaver, whose parents lived on Beach Avenue. A year earlier he was newly in the city as manager of a knitting company called Mackay Smith Blair & Co whose premises were at 206 Cambie on the corner of Water Street. In 1915 he was manager of Pride of the West Knitting Mills at 848 Cambie Street. By 1918 he’d established Universal Knitting at 624 Smithe Street, moving to this building by 1920. We previously identified the architects of the building as likely to be Dalton and Eveleigh in 1907, with Thomas Hooper designing $1,000 of additions for the News-Advertiser in 1910. Most recently it was occupied by Pappas Furs, but for now it awaits a new office tenant. There’s a complicated back story to this rather unassuming building on Burrard Street. As far as we can tell, the foundations for the site were laid in 1912, just as one of the city’s major development booms was starting to run out of steam. The Ramsay Hotel Co had a permit for this corner of Burrard and Melville Street for a 10 storey $520,000 hotel. The architect on the permit was identified as N A Leach. In fact he was Norman Leech, and he was the architect for the Vancouver School Board. The city’s clerk – probably accidentally – spelled his name correctly once, and wrongly on the other 27 permits he applied for. It seems odd that Mr Leech would have time to design such a large commission with so many schools to develop across the rapidly expanding city. The explanation is probably contained in another announcement about the Ramsay Hotel – this one in The Province. Here the location is described as Burrard and Dunsmuir, and the architects are identified as Seattle based Quandt & Creutzer. So Mr Leech’s job was probably to supervise the processing of the permit and perhaps the day-to-day site supervision. 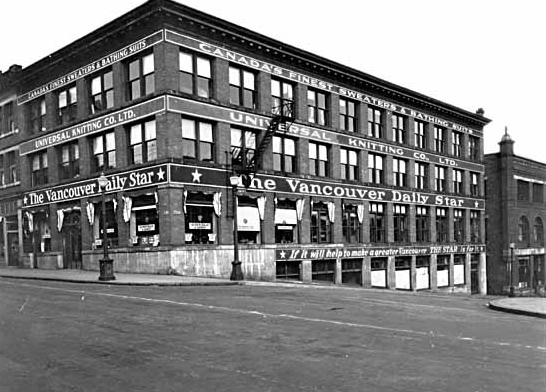 The Daily World reported on December 11th 1912 that the Liquor Licencing Board “was notified of the commencement of the Ramsay Hotel on Burrard street, at the corner of Melville, and received the assurance of both Mr. Ramsay and his architect that the work would be continued, until the building was completed. At a recent meeting the board asked for this assurance as it granted a license to Mr. Ramsay on the undertaking that his hotel would soon be completed” – and the 1912 insurance map confirms that the foundations were laid. However, not only was this bad timing from the point of view of the economy – it wasn’t the best time in competition terms either – the massive new Hotel Vancouver was being built just a couple of blocks away, and costing an even more enormous amount. Then the economy hit a full-on recession, and there was a war declared. We can see the first couple of floors of building in the 1914 panorama above – but nobody seems to be on site, building. Nothing appears in the Street Directories for this block for several years. 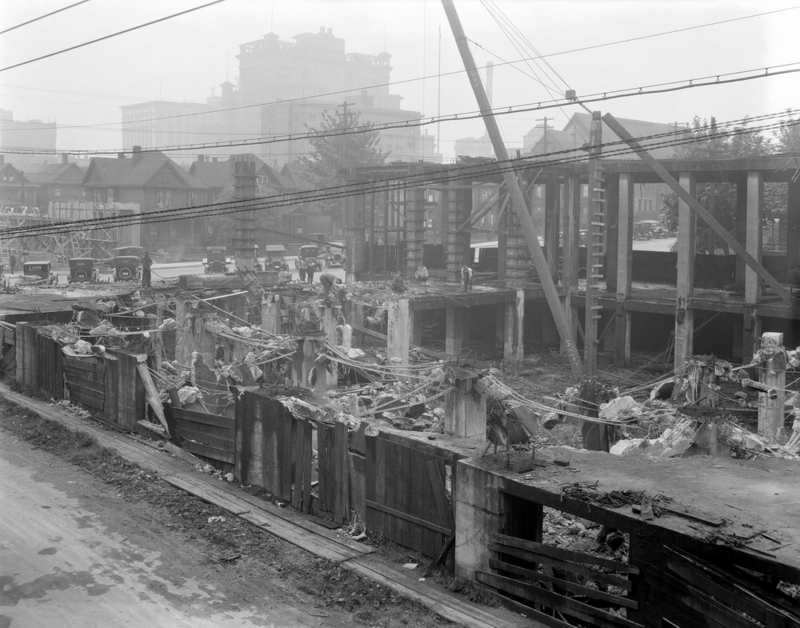 The 1923 picture looking north down Burrard Street shows why – some of the frame is still there, increasingly stained, but clearly still standing. Very few changes have occurred on Burrard either – the city’s economy struggled for several years after the war was over. Then in 1926 this photograph was shot, showing ‘construction at Burrard and Dunsmuir’. We’re pretty certain that what it actually shows is demolition rather than construction – the northern part of the unbuilt Ramsay Hotel was being cleared, but it looks as if the frame to the south might have been retained, and we’re suggesting that it might have been re-used in the construction of the lower part of the building on the corner of Melville and Burrard as an auto accessory warehouse for McKenzie, White and Dunsmuir Ltd in 1927, designed by by J Y McCarter. 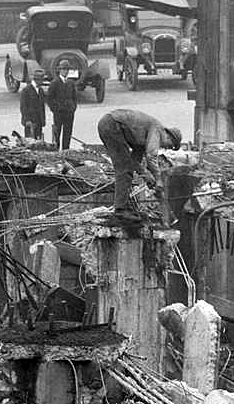 (Demolition was undoubtedly a riskier business in those days, if this detail from the image is anything to go by. In 1938 the British Columbia Government attempted to collect tax from Firestone, the tire company, for sales of their tires made by McKenzie, White and Dunsmuir as distributors (representing about a quarter of McKenzie’s business). The case ended up passing up through the hierarchy of courts, and eventually the government lost the case heard by the Supreme Court in 1942. The Archives have some excellent images of the company’s activities, including a woman working on a crankshaft in 1944. Next door a new building was completed for Clark Parsons Buick Ltd. Not too much later they were taken over by Bowell McDonald – a Pontiac, Chevrolet and Buick dealership who became better known later in a foreshortened version – Bow-Mac. It’s really hard to believe these two images are nearly 30 years apart. 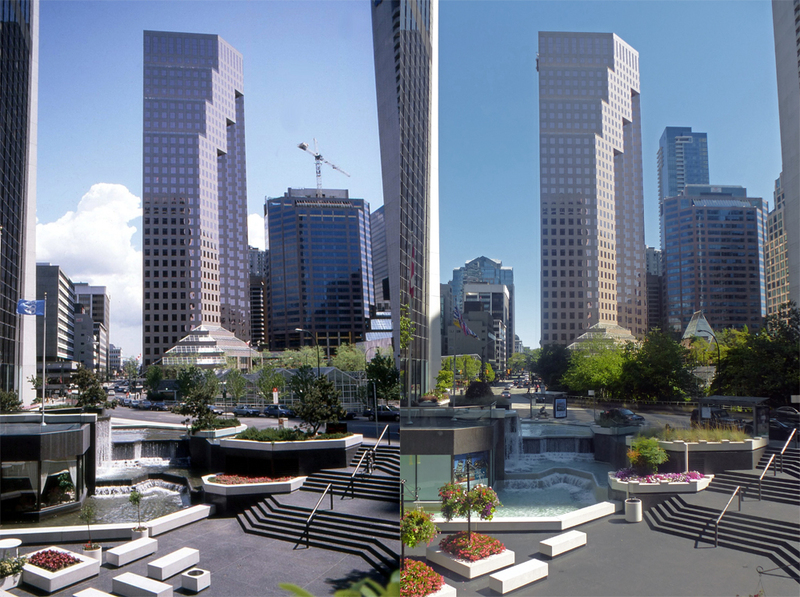 The shot on the left was taken in 1986, when Park Place – the tower in the middle – was less than two years old. Designed by Musson, Cattell Mackey it was the first building to get additional density (from Christ Church next door) in exchange for heritage retention of the cathedral. There’s an office building in Houston that Park Place referenced, and our book, The Changing City, describes how the building’s Spanish pink granite and “copper-rose” reflective windows create an interesting reflective surface, with the building cutting a distinctive profile on the skyline. Our pictures were taken from the plaza of the Bentall Centre – apart from somebody shuffling the benches it looks the same (and as good) now as it did then. The darker, squarer building on the right was brand new in 1986 – the crane was still up and the roof is still being glazed. At the time it was going to become the new home for the Bank of British Columbia (and initially called Tower 885) but it would soon be taken over by the Hong Kong and Shanghai Bank. It was designed by Webb Zerafa Menkes Housden Partnership, based in Toronto. The biggest changes that can be seen are probably that one building has gone, and three have appeared. On the far left, on the corner of Burrard and Dunsmuir, the previous version of the YWCA building was far bigger than the Cactus Club and plaza that are there today. Behind it 777 Dunsmuir can just be seen, a later phase of the Pacific Centre Mall. Behind the Hong Kong Bank is the recently completed Residences at Hotel Georgia, a 48 storey mixed-use tower. Over on the far right Cathedral Place, a 1992 office building has been built. The smaller associated gallery museum (now the Bill Reid Gallery). In 1986 the Georgia Medical-Dental building was on that site, but just out of the shot, demolished in 1989. The other obvious change is 28 years of tree growth, especially apparent on the area around the Burrard SkyTrain Station (now called Art Phillips Park). In the very early 1900s C F Mills, and two years later Mills and Williamson, obtained permits for a pair of houses on the corner of Burrard and Davie, which were clearly shown on the 1912 insurance maps. Mrs Alice Lyon built a house in 1901 on the third lot south at 1212 Burrard. Over time Burrard Street shifted from a quiet tree-lined residential street to part of the Downtown’s commercial area. This corner was redeveloped around 1928 to reflect the city’s expanding connections to the movie industry. The Vancouver Public Library title for this image says it was the Vancouver Motion Pictures Ltd. That company was incorporated in 1928 by R.E. Bourne, Charles McKenzie and Harry Rosenbaum. It was operated by Leon Shelly of Shelly Films Ltd. and an important early independent production company of documentary industrial films. Some films were produced on contract for the National Film Board of Canada. However, there were a whole series of other movie companies based in the building – a virtual who’s who of movie making. Canadian Educational Films, Limited, Canadian Universal Film Company, Famous-Lasky Film Service, Limited and F.B.O. Pictures Corporation of Canada, Limited were all listed here, as well as Regal Films Ltd, Warner Bros Pictures, RKO Distribution Corp of Canada, Fox Film Corporation and United Artists. We recently discovered the architect of this building – like many in the late twenties and early 1930s it had design references to Mission revival style – even more popular (and appropriate) in California. It was designed by H H Gillingham, an English-born architect who is better known as the architect of the Commodore Ballroom on Granville Street. We haven’t identified the architect of the 1978 office building that replaced it. Sold in 2009 for $19m to Hong Kong World Holdings, the building is full of doctors and dentists with increasingly hi-tech gadgetry that added together might be worth more than the building. We’ve featured both of the buildings in this picture already. On the left is Max Downing’s retail building for the Hudson’s Bay Company from 1933, and on the right is the St Regis Hotel. Leon Melekov, a successful businessman, hired W T Whiteway to design the hotel which opened in 1913. This 1974 image shows that neither building looked as good 40 years ago as they do today. The Archives identify the two businesses on the left as Salon George and Rae-Son Shoe Rack. The Salon was offering $2.95 haircuts. The hotel was given an extensive $12m makeover, reopening in 2008 after an expensive new underground connection was built to allow disabled access for the SkyTrain station nearby. This was the community amenity contribution that allowed the residential tower that now fills in the sky behind the two buildings: The Hudson (on Granville Street). The Gotham steakhouse was renovated earlier by the same owner. When it first opened the St Regis initially operated as a business hotel. Later it was where visiting sportsmen often chose to stay, and by the time this picture was taken it had moved further down market with a strip show – one of around thirty in the city at that time – and in the final years before renovation it featured Jester’s Grill and Tap Room. Today this is half of the Gotham Steakhouse (now numbered as 615 Seymour), a single storey protected heritage building next to the St Regis Hotel. In 1943 in this Vancouver Public Library image it was home to Brooks Corning, an office furniture company who have been in business in the city for over a century. This was their store when the building was just 10 years old. We’ve seen a series of buildings in the Art Deco style by Townley and Matheson – but this is by a different architect, Max Downing. He worked in the city from 1910, and in 1933 he was hired by the Hudson’s Bay Company to design this project – (the Bay’s main building is just up the street on the same block). The building used cast in place concrete with either terra-cotta or cast concrete patterned detailing below a crenellated concrete cornice. From 1936, the same year that Brooks Corning moved in, the other half of the building was occupied by the Deutschland Café. 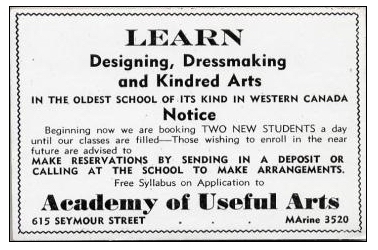 For obvious reasons that business did not continue in the 1940s, and when this picture was taken the occupant of the other half of the building was ‘The Academy of Useful Arts’. Those are almost certainly dress forms for tailoring in the window. The Deutschland Café had been on Robson Street in 1934, and the earliest tenants of this building appear to have been B A Rhodes selling sporting goods and Lewis and Sills selling hardware in the right hand store, while Dale’s Doggie Headquarters shared premises with the Empire Garden Nurseries in this half of the building – although the doggies only lasted a year, and the plants only another year after that.